Meet Pliobates catalonia, an extinct species of ape that roamed the jungles of Catalonia some 11.5 million years ago. Because of this ancient creature’s many surprising physical characteristics, researchers are having to revise their conceptions of what the last common ancestor of all living apes—humans included—might have looked like. Pliobates lived long after a time when great apes are believed to have split from small-bodied apes, about 17 million years ago. The discovery of this new fossil—which features characteristics of small-bodied apes, great apes, and even monkeys—is forcing a rethink of early ape evolution. The details of the study can be found in the latest issue of Science. “This fossil discovery is providing a missing chapter to the beginning of ape and human history,” noted Sergio Almécija, assistant professor of anthropology in the Center for the Advanced Study of Human Paleobiology at GW’s Columbian College of Arts and Sciences, in a release. Anthropologists used to believe, perhaps counterintuivitely, that small apes evolved from larger-bodied apes, mainly due to the lack of small apes and ancient gibbons in the fossil record. Some scientists went so far to suggest that small-bodied apes were actually a dwarfed version of great apes. But Almécija and colleagues say that the discovery of Pliobates—a new genus and species of small ape that existed before the evolutionary divergence of greater apes and lesser apes—shows that small and large apes may have co-existed around the time when hominoids first emerged. The new species was discovered in 11.6 million-year-old deposits at Hostalets de Pierola in the Valles-Penedes Basin. Analysis of the partial skull and bones by a team of researchers from the George Washington University and the Institut Català de Paleontologia Miquel Crusafont shows it was a relatively small ape, weighing only 4-5 kg (9-11 pounds). It inhabited a forested environment and, like extant Gibbons, foraged on soft fruit. But it also featured very great ape-like characteristics. Though its teeth were quite primitive—with sharp and prominent cusps—Pliobates’s skull and brain-to-body ratio were more similar to that of a great ape. Its wrists allowed for sufficient rotation required for cautious climbing and clambering in trees, another characteristic of great apes. At the same time, however, its elbow lacked a critical stabilization feature for hanging in trees, which differentiates living apes from other primates. Surprisingly, it featured an external bony ear more primitive than those found on monkeys that lived millions of years earlier. Taken together, these findings indicate that the last common ancestor of apes might have been a lot less ape-like than previously assumed. At the same time, the discovery could explain the origin of extant gibbons. 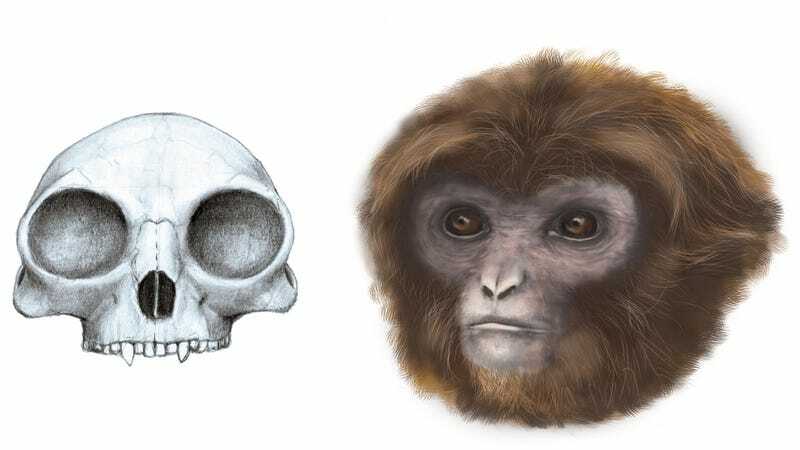 “The origin of gibbons is a mystery because of the lack of fossil record, but until now most scientists thought that their last common ancestor with hominids must have been large, because all of the undoubted fossil hominoids found so far were large-bodied”, explained study co-author David M. Alba in a release. Prior to the recent discovery, all small-bodied ape-like creatures discovered featured a body plan too primitive to be closely related to living hominoids. “This find overturns everything”, says Alba. Read the entire study at Science: “Miocene small-bodied ape from Eurasia sheds light on hominoid evolution”.